Please see the news release below. Stayed tuned today for an announcement on the Child Care Operators! 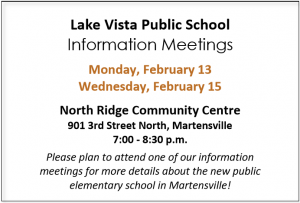 When the information becomes public it will be posted on the Lake Vista Public School website. Please remember that priority will be given to children residing in the school community, as well as to those with siblings enrolled in the school. Members of our playground committee will attend a meeting tomorrow night at 7:00 pm with the members of the Ecole Holy Mary Playground Committee. The meeting will be at the Martensville Athletic Pavilion. Please don’t hesitate to contact me (chris.mason@spiritsd.ca or 306-683-2924) with any questions that you may have. The video link below is the same one that was used at the parent meetings last month. There has been a lot of work done inside the school since the pictures in this video were taken. I will be able to tour the school again this week and I will post more current pictures next week (once they are approved by the company building the school). There will start to be decisions made about the Child Care Provider and the Before and After School Program soon. Attached to Lake Vista Public School is a Child Care center that can accommodate up to ninety children. Priority will be given to children residing in the school community, as well as to those with siblings enrolled in Lake Vista. There will be a Before and After School Program at Lake Vista. Please do not hesitate to contact me (chris.mason@spiritsd.ca or 306-683-2924) if you have any questions. We are having our first playground meeting tonight. The meeting will be at Venture Heights School starting at 7:00. At our meeting we will be discussing our playground, our logo and school name, and school pictures. We would like to welcome any parents whose children may attend Lake Vista in the 2017-2018 school year. Below is a rendering of what they playground may look like. It is one of the topics we will discuss tonight. We look forward to seeing you there! We had very successful meetings on Monday, February 13 and Wednesday, February 15. I would like to thank everyone for coming out to those meetings. Below is some attached information about Lake Vista. The excitement for the school is building. Many families have committed to having their children attend Lake Vista. Please ensure that you fill in the Family Information Form. Every family with a child that attends school in Martensville or child that will be attending school in 2017 needs to fill the form in. These forms will provide us with the information we need to continue to make decisions around transportation, staffing, and other important decisions. The Child Care provider will be chosen within the next couple of weeks. A decision on the Before and After School Program will also be decided within the next few weeks. Please subscribe to this website for the latest updates and information. If you are interested in volunteering for our Playground Committee please contact Chris Mason. We have our first meeting on Thursday, March 2 at 7:00 pm. This group will also serve as a parent advisory group for many exciting decisions that will be made about Lake Vista School. If you have any questions please do not hesitate to call (306-683-2924) or email (chris.mason@spiritsd.ca) Chris Mason (principal). The attachment above will provide you with some information about Lake Vista Public School, which will be opening in September, 2017. We have another parent information meeting tonight at the Northridge Center. The meeting will start at 7:00. There will be a summary of the meeting posted on this website tomorrow.